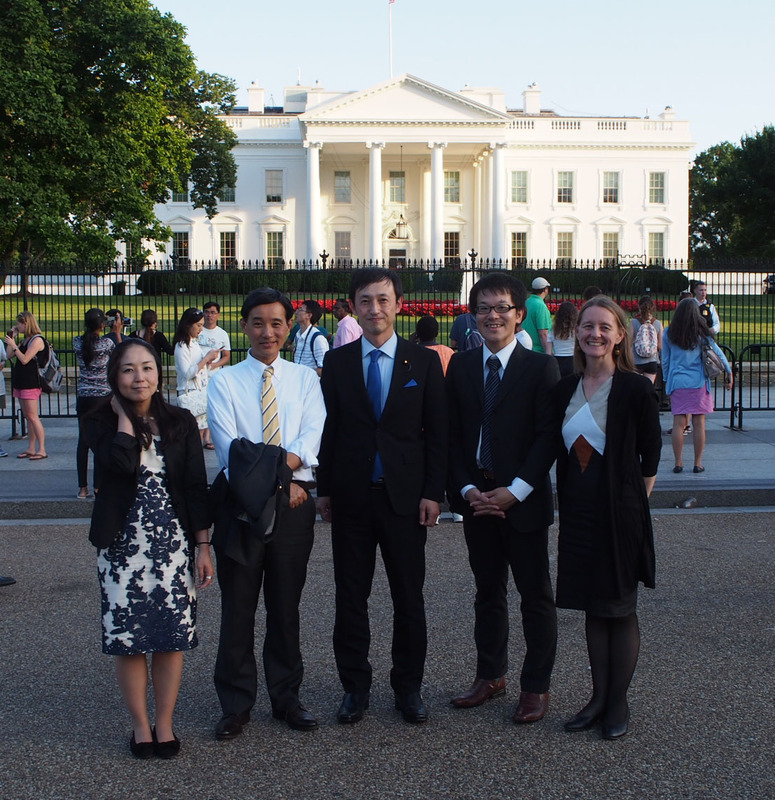 From June 24-27 CNIC, together with New Diplomacy Initiative, organized a delegation of Diet Members to visit the United States in order to discuss Japan’s plutonium policy with US Congress Members and officials. This is the third such delegation; the first one visited the US in September last year (see NIT No. 180) and the second in February this year. Apart from being the culmination of previous meetings and discussions, there were several factors which made this delegation an important one. Just before the delegation left for the US, the Nikkei newspaper (June 10) published an article stating that the US government had requested that Japan reduce its plutonium stockpile of 47 tons (enough to make 6,000 nuclear bombs) as there were concerns that Japan’s possession of this amount of plutonium would interfere with US-North Korea denuclearization negotiations. The article suggested that the Japanese government would ‘respond in good faith to the [US] request.’ It seemed that the timing of the automatic renewal of the US-Japan Nuclear Cooperation Agreement on July 16, which would allow Japan to continue to reprocess its spent nuclear fuel, had prompted the US to make this request. Although the Agreement would not be altered, the US required some official assurance, in the context of their negotiations with North Korea, that Japan’s plutonium stockpile would be reduced. This was what our previous two delegations had lobbied for- the US had indeed requested Japan to reduce its plutonium and Japan had agreed. However, in the absence of details regarding to what level and by when this reduction would take place, it would be easy for the government to stick to its ineffective plan of burning the plutonium as mixed oxide (MOX) fuel in light water reactors. The mission of the third delegation was to show that the MOX plan simply would not work and to discuss concrete ways that, together with US supporters, we could make the most of this historic chance and hold the Japanese government to its pledge to actually reduce the plutonium stockpile. This time we visited the offices of 6 Senators and 8 Representatives (2 Republican and 12 Democrat). We also had breakfast, lunch and dinner meetings with 3 experts and a dinner meeting with journalists as well as holding a press conference. 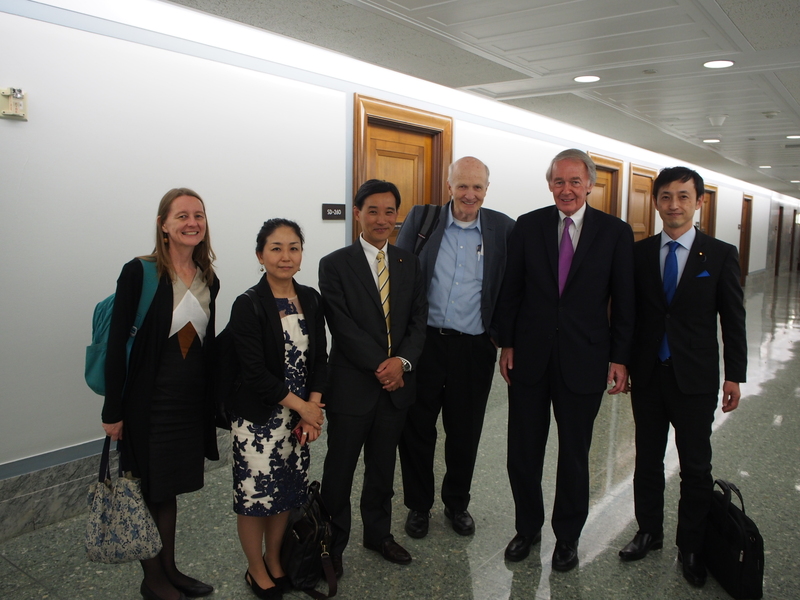 In most cases, this was the third time for us to be meeting with some of the Congress Member staffers and many, apart from being impressed with our perseverance, were well aware of the issues we had come to discuss and shared our concerns regarding Japan’s plutonium. 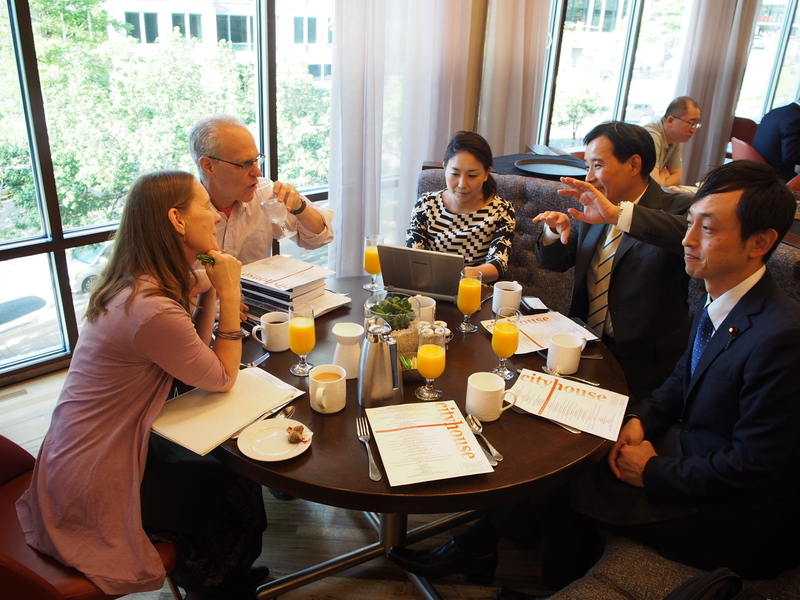 Everyone we met agreed that Japan’s plutonium stockpile was a problem because of proliferation concerns and the impact it has, not just on neighboring countries. North Korea is not the only country to be worried that Japan must be amassing such huge quantities of plutonium in order to develop a nuclear capacity; South Korea and China have also expressed such concern. China also has plans to build a reprocessing plant and many in the South Korea nuclear community think it is intrinsically unfair that Japan is allowed to reprocess and they aren’t under the terms of their 123 Agreement with the US. Thus there is no doubt that Japan’s plutonium stockpile is creating instability in the region. Not only the region, but other countries such as Saudi Arabia, which is in negotiations with the US regarding nuclear commerce, also make demands that they too be allowed to reprocess the spent fuel that will be generated in any nuclear reactor they operate in the future. There was a lot of concern within Congress that the ‘Non-proliferation Gold Standard’ of not allowing any country to produce materials such as plutonium and enriched uranium, which can be used to make nuclear weapons, must be maintained. Japan’s exception and the existence of its large plutonium stockpile only make it more difficult for the US to maintain this standard. It would seem that even the Japanese Government, at least the Ministry of Foreign Affairs, may have understood this point and thus acquiesced to the US request to reduce the plutonium stockpile, but the next vital question which we discussed with our American counterparts was HOW Japan will actually do this. When the 123 Agreement was signed 30 years ago, Japan planned to use the plutonium in its fast breeder program, but since Japan’s Monju FBR is being decommissioned, the Japanese government’s alternate plan is to burn the plutonium as mixed oxide (MOX) fuel in reactors. As we emphasized in our discussions, this plan is more of an excuse and is in no way grounded in reality. Only 3 MOX-burning reactors are currently in operation, which are estimated to consume a mere 1.5 tons of plutonium annually. With the slow pace of restarts since the Fukushima accident, it is not likely that very many more MOX reactors will come online soon. Thus reducing even the current plutonium stockpile of 47 tons by burning it as MOX will take a very long time. There are other fatal problems, such as 7 of the 10.8 tons of plutonium held domestically was separated for use in FBRs and over a long period of time it has decayed and is no longer suitable for light water reactor MOX fuel. In any case, the Japanese MOX fabrication plant is still in the early stages of construction and no one knows when or if it will be able to operate. There are also the massive costs involved in the entire nuclear fuel cycle. The US also has a failed MOX program, so there was much sympathy and understanding regarding the Japanese situation. The US MOX plant, which was under construction at Savanah River, was supposed to dispose of the plutonium taken out of weapons at the end of the Cold War by manufacturing it into MOX fuel and then burning this fuel in commercial reactors. The high costs involved have caused successive US Administrations to cut funding for this project and search for alternative disposition methods. Our point was that this is the area where Japan and the US should be cooperating, for example, conducting joint research into plutonium dilution and immobilization. There was also broad agreement in our discussions that starting up the Rokkasho Reprocessing Plant would have a further destabilizing effect in terms of non-proliferation and that an official freeze on the project would enhance discussions on a regional commercial plutonium pause. Taro Kono, the Foreign Minister, recently described the US-Japan Nuclear Cooperation Agreement as ‘unstable.’ He was most probably referring to the terms of the renewed 123 Agreement which allow either party to withdraw from or re-negotiate the Agreement with 6 months notice. As the Foreign Minister, and also as an individual who is staunchly opposed to reprocessing, he is keenly aware of the effects that Japan’s plutonium stockpile is having on the international stage and the necessity of actually complying with the US request to reduce it. Pressure from the US undoubtedly played a big part in the Japanese government’s policy to reduce the plutonium stockpile, announced officially in the new Strategic Energy Plan released on July 3. But the real point of US pressure is to make the plutonium stockpile into an issue in Japan which can stimulate domestic debate on the nuclear fuel cycle. The government surely hopes that no one will notice when its MOX solution to reduce the plutonium stockpile fails, and it can keep on with its business-as-usual approach. Our job is to make sure there is enough attention and interest to prevent this. We gained much bipartisan support during our talks in the US and we must put substance to this through writing articles, letters, statements and so on. But as our friends in the US also emphasized, the real change in Japan’s nuclear fuel policy will not come from US pressure, it is a decision for Japan and the Japanese people. Our hope is that we can take this opportunity, created by historical circumstance and international cooperation, to convey the serious problems of Japan’s plutonium stockpile and nuclear fuel cycle to a larger domestic public and forge change from within. Previous story Preventing the Restart of Kashiwazaki-Kariwa Nuclear Power Station is Possible!